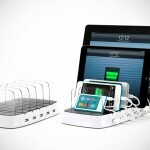 if not for the presence of orange hue on this MultiDock USB charging station, you might think it is an Apple product. 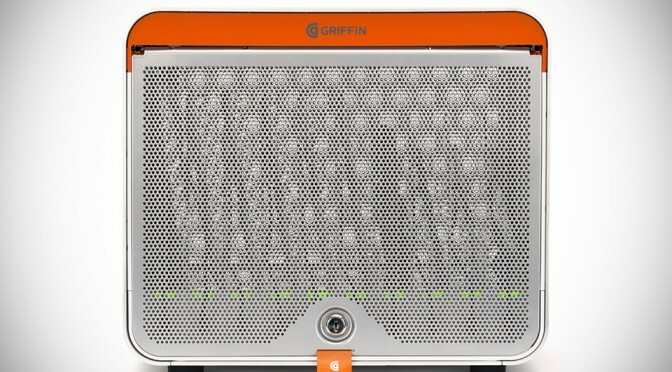 leveraging on former Apple designer, Thomas Meyerhoffer’s expertise, Griffin sets out to completely rethink the MultiDock that was first introduced in 2011 and the result is this eye-pleasing, Apple-ish device that we could only described as a huge leap in industrial design standpoint. 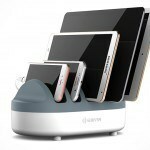 designed to charge up to 10 iOS or Android devices, the new MultiDock boasts Griffin’s exclusive ChargeSensor technology which automatically adapts on the fly to the charging characteristics of each connected device and supplies the charging rate each device needs for fastest, most complete charging. there’s also a Quick Charge Mode, automatically activated upon connection to Apple small devices equipped with Lightning connector, to charge the newer Apple devices at the fastest possible rate, even while syncing. 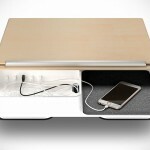 as a single MultiDock, it can be secured to a table, desk or countertop, but it also comes with the hardware necessary for stacking up to three units with a potential to charge up to 30 devices from a single computer, simultaneously. the enclosure is made of clear, anodized finished aluminum and has a lockable, perforated front door made of steel to keep the devices within secured and at the same time, encourages airflow and allows you to keep tab on the charging and syncing status by glancing at the color-changing LEDs available on each bay without opening the door. 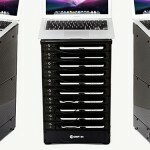 the Griffin MultiDock USB Charging Station is available in two configurations: a single MultiDock unit with 10 bay, and a stacked 30-bay cart complete with smooth rolling wheels, handle and a lockable laptop tray for accommodating a 15″ MacBook Pro, or equivalent laptop. available sometime this month for $699 to $2,399. more look after the break.